PESHAWAR -- Faced with growing pressure on the battlefield and plummeting popular support in Afghanistan, the Taliban have resorted to spreading conspiracy theories in an attempt to regain legitimacy in the eyes of the public. A delegation comprising members of the Afghan High Peace Council (HPC) and religious scholars visited with Pakistani scholars and officials last week in order to work out an agenda for a proposed ulema conference. The conference would build on past ulema council meetings in Indonesia and Saudi Arabia. The delegation arrived in Islamabad Friday (September 28) and returned to Afghanistan Monday (October 1). Fearful of what might transpire as a result of the talks, the Taliban released a statement Saturday attempting to paint the participating ulema as part of a US government plot to strip the group of its legitimacy. The statement exposes the Taliban's fears and desperation and is filled with clearly false information. The "Central Intelligence Agency (CIA) has produced an action plan for Pentagon officials urging to use clerics against the ongoing jihad in Afghanistan, issue a fatwa against jihad through them, promote false peace through sit-ins, publish reports of false negotiations in the media and attempt to divert public attention from the Americans' military defeat," the statement said. The statement points to earlier meetings of ulema in Indonesia and Saudi Arabia as previous examples of this "American plan". In May, religious scholars from Afghanistan, Pakistan and Indonesia conferred in Jakarta, and called on the Taliban to to take up President Ashraf Ghani's offer of peace talks, according to a joint statement issued by participating parties. Ghani announced in February a peace plan that could see the Taliban become a political party. However, the Taliban declared a spring offensive April 25, apparently rejecting the plan. On June 4 in Kabul, Afghanistan's Ulema Council convened a conference of almost 3,000 clerics, who issued a fatwa terming suicide attacks and bombings "haram". In July, more than 100 Muslim scholars from 57 countries used their collective strength and the teachings of the Koran to announce their full support for lasting peace in Afghanistan. The International Ulema Conference on Peace and Security in Afghanistan was sponsored by the Saudi government and the Organisation of Islamic Co-operation. "We call upon Afghanistan's government and the Taliban movement to conform to a truce and ceasefire and set on a track of direct Afghan negotiations," the ulema said in a joint declaration July 11. "Based on the texts of the Koran and the tradition that Islam is a religion of peace and mercy, that the believers should all be merciful towards one another, and that their blood, property, and honour are inalienable and should be protected against aggression, we hereby affirm that the suicide attacks targeting innocent people, and that [internecine] killings among Muslims are all acts that are prohibited by Allah and His Messenger under texts that are conclusively clear and well-established," the declaration said. "A national dialogue is the optimal way to end the conflict between the Afghan government and the Taliban movement," the declaration said. The Taliban, however, condemned the internationally respected participants of these conferences as mere pawns. "The Islamic Emirate once again calls on true, independent religious scholars in Afghanistan and Pakistan to refrain from such meetings so as not to fall victim to the machinations of the American strategists and their intelligence services," the Taliban statement said, using the name it calls itself. Considering the large number and influence of the ulema from numerous countries around the world who have participated in previous conferences about peace in Afghanistan, observers wonder who these "true, independent religious scholars" are that the Taliban are referring to. Ata-ur-Rahman Saleem, deputy head of the HPC, led the Afghan delegation to Pakistan. Members of the HPC met with Maulana Sami ul Haq, chief of Darul Uloom Haqqania, an Islamic seminary in Akora Khattak, Pakistan, on September 30, where they discussed regional peace, the seminary announced. Afghan Ambassador to Pakistan Omar Zakhilwal, HPC members and religious leaders sought Maulana Sami's support to end the Afghan conflict, the statement said. "The delegates requested Maulana Sami ul Haq to act as a mediator between the Afghan government and the Taliban," Yousaf Shah, a spokesman for the seminary, told Pakistan Forward. "[The delegation] assured him that they would accept his decision in this respect." The Afghan delegation called on Siraj ul Haq, chief of Jamaat-e-Islami (JI), a Pakistani Islamist political party, in Islamabad on October 1 to seek a solution to terrorism in the region, HPC spokesperson Syed Ihsan Taheri told Pakistan Forward. "The meetings focused on Afghanistan's situation," he said. "[Participants] agreed to co-ordinate efforts from both sides with a peace road map drawn under the banner of Afghanistan's national reconciliation process." Analysts are pinning hopes on the outcome of the ulema conferences at a time of increasing pressure on Pakistan to push the Taliban to the negotiating table. The Afghan people have suffered massively from terrorism and recognition is growing that negotiations are the only way to achieve peace, said Brig. (ret.) Mehmood Shah, a Peshawar-based security expert. "A negotiated solution to terrorism is possible through religious leaders who have vast support among the groups involved in acts of violence," he told Pakistan Forward. "The role of religious scholars is significant in ending the Afghan imbroglio." Maulana Sami "is known among the warring [Taliban] factions, and they trust him -- because of which the prospects of peace are brighter," he said. "He can help reduce fighting." "It is obvious to everyone that wars bring only miseries; therefore, the Afghan government is making an all-out effort to ensure security, good governance, justice, education and health and to create economic opportunity for its [citizens]," Shah said. Maulana Sami enjoys public respect and can play a positive role in starting the peace talks with the Taliban, Darul Uloom spokesperson Yousaf Shah confirmed. "The Afghan issue is very complicated," Maulani Sami told the visiting HPC delegation, according to Shah. "Several international actors are reluctant to resolve it." "We are eager to witness an end to the internal violence and hostilities in Afghanistan," Maulani Sami told Pakistan Forward by telephone. "I have proposed a meeting of Afghan ulema with the Taliban leaders without the involvement of foreign forces or of other countries so the two sides can understand each other's point of view and build an environment of trust," he said. "The solution to the Afghan issue lies in unity among Afghans," he said. "We should be making efforts to persuade warring [Afghan Taliban] groups to bury the hatchet and start their lives afresh." 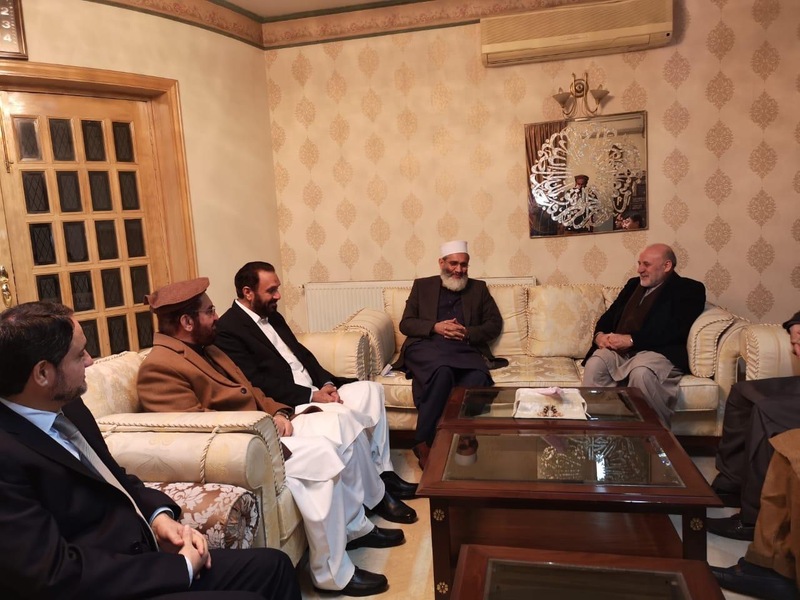 "Maulana Sami ul Haq and Siraj ul Haq assured us of their co-operation for a peaceful Afghanistan," Fazl Hadi Muslimyar, an HPC member and chairman of the Meshranjo Jirga (upper house of the Afghan parliament), told Pakistan Forward. Religious leaders can play a vital role in ending the conflict, said Saqibullah Khan, a political science lecturer at the University of Peshawar. "Many Taliban leaders have been students of [Maulana] Sami ul Haq. They respect him," he told Pakistan Forward. JI has strong links with Taliban leaders as well as with some Afghan militant groups, which can be used positively, he said. Foreign forces attacked Taliban regime, now the problem will be solved if rest of the public implements Islamic system the same way as Mr. Mulla Umar did. Admin! You and scholars of this conference, all are slaves of Jews, nonbelievers, and specially Americans. Talks will never be successful until American forces are there. Call me when last soldier is gone, I would make it a success. It is not acceptable for one party that at one hand they are being declared terrorists and are attacked every day and on the other hand they are being invited for peace. Here you can only write and post against Taliban, it has nothing to do with reality. The fact is that Afghan people and Afghan religious scholars were with Taliban in the past, they are with them at present and will be with them in future. Only way of peace is withdrawal of foreign forces that you never want. That is why we also want that foreign forces stay here and Taliban also keep on striking them until any of them are alive. It's a reality that this article is based on the friendship of USA. If Taliban have started Jehad according to the Fatwa of Sami Ul Haq, then he can bring an end to it. If Jehad was started against the occupation according to the Sharia and Fatwa, then the end of occupation is the only solution to this crisis. War destroys a nation and peace cannot be achieved by force. Reconciliation is good. if war could build a country, then Afghanistan would have been a better country than others. These efforts should be continued and such conferences should be organized in other countries as well and its decisions should be published in media. Sami ul Haq was the chief of his own political faction -- Jamiat Ulema-e-Islam (S) -- and led the controversial Haqqania madrassa. He was found stabbed to death in Rawalpindi.